What is a Call Graph? 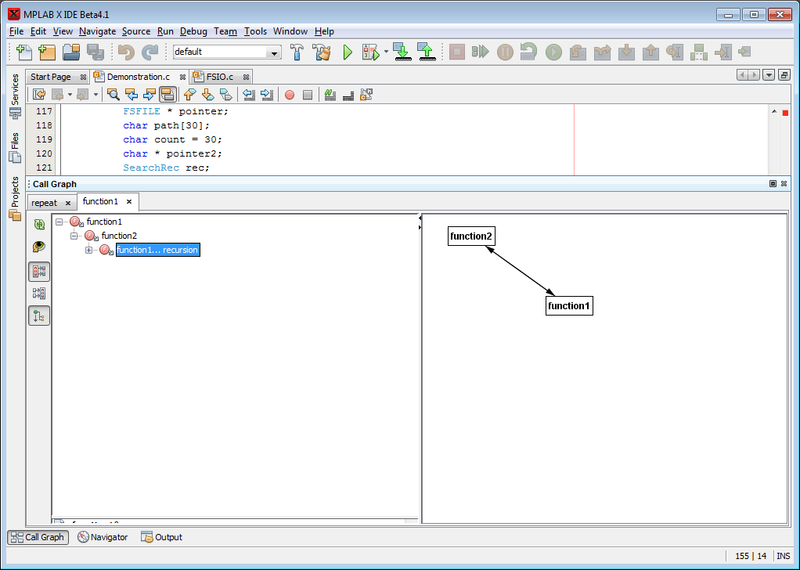 A Call Graph allows the user to view the relationship between Parents and Child subroutines in their program. In essence, Each node in the Call Graph represents a function (f) and each edge represents the function (g) being called by (f). A node can be thought of as the "Parent function" and each node as the "Child function". 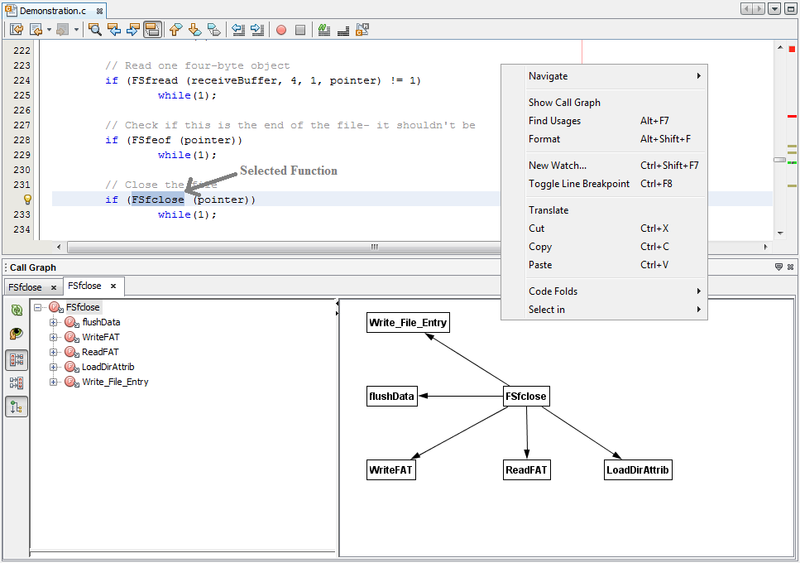 Call Graph functionality is supported by the IDE. To view its functionality, go to the toolbar click on Window-> Output-> Call Graph. An empty (Call Graph) window should appear below your code. To populate the Call Graph window, we must first highlight a function in your code, do a right-click and select "Show Call Graph". At this point you should see the Call Graph Window populated with a graphical image showing the relationship between the selected Parent function and its Children functions. 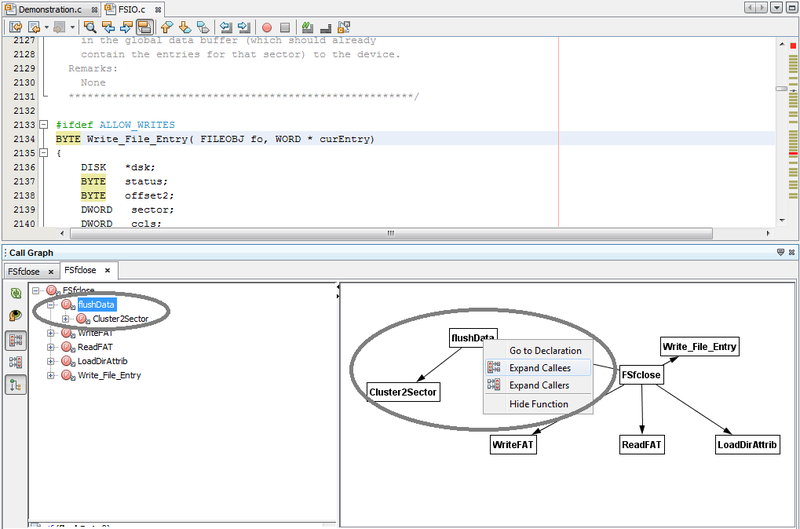 The IDE allows you to view the declaration of the selected function using Call Graphs. The Call Graph window is divided into two sections. 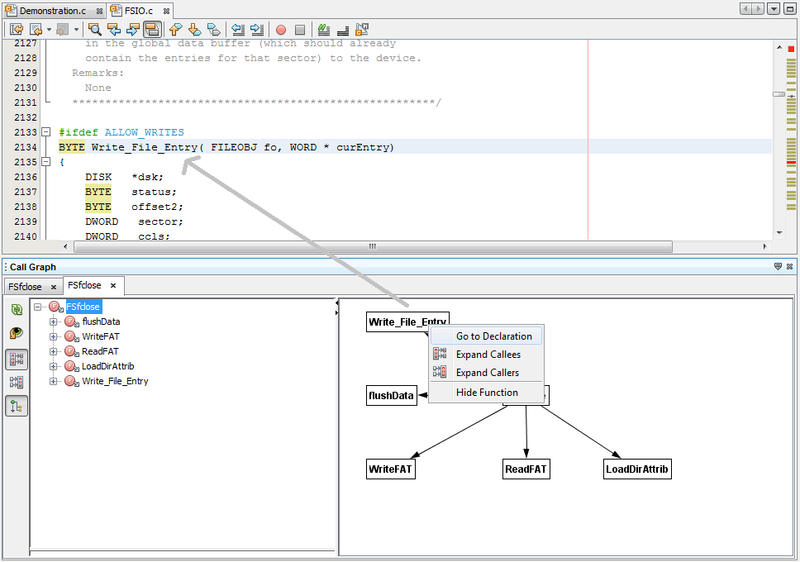 The left hand side of the call graph window shows a Collapsing/Expanding tree menu of the Parent and Children function. 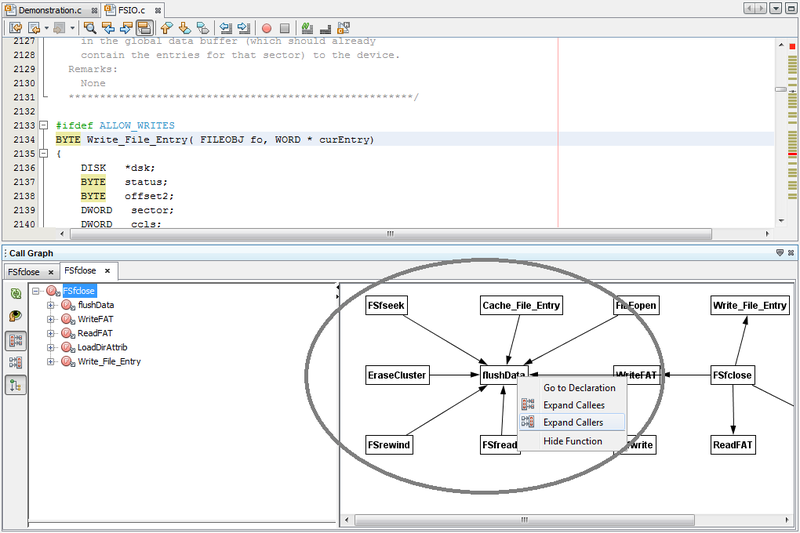 The right hand side of the Call Graph window shows a graphical representation of the Parent/Children functions. To view the declaration of the function, hover over the desired function, right click on it and select "Go to Declaration" . MPLAB X will then open the .c file where the function was declared. Select a function whom you wish to know its children functions. Click on the (+) sign to expand the menu tree. A list of children functions should appear in the menu tree as well as in the Graphical representation of the call graph. Select a function whom you wish to know its children functions. Right click on the function and select "Expand Callee". A list of children functions should appear in the menu tree as well as in the Graphical representation of the call graph. In the graphical representation of the Call Graph, select a function whom you wish to know its parent function. Right click on the function and select "Expand Callers". A graphical representation of all the parents functions calling the selected function should appear in the Call Graph window. MPLAB X allows you to export the Call Graph in a .png file. To export the Call Graph, right click anywhere in the Call Graph window and select "Export". A "Export Graph As" window will appear, type a file name for your graph and click Save. 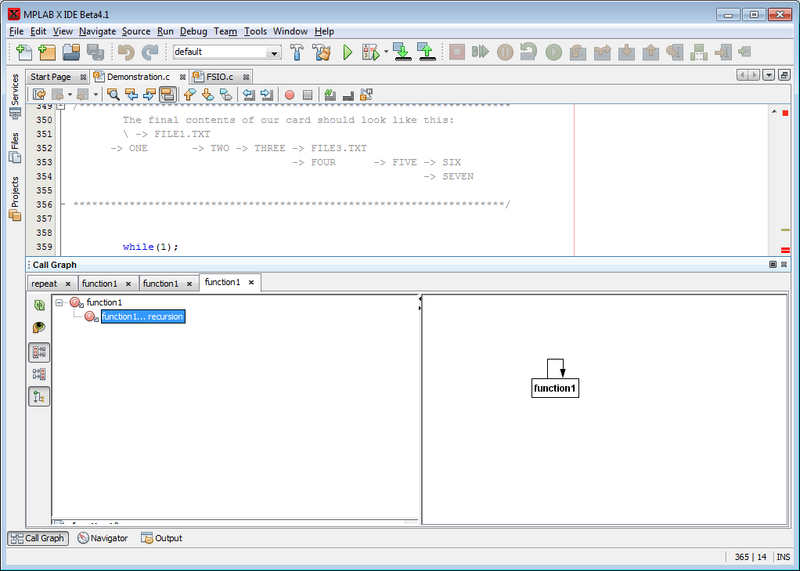 Recursive functions are detected by MPLAB X and they are shown in the Call Graphs as recursive functions (See Figure 1.5 & 1.6).